Easy to use — cover your cake with fondant then smooth the sides of the cake, adhering the fondant to the buttercream under layer. 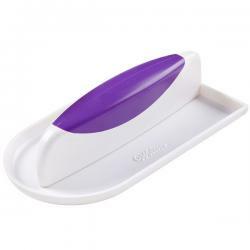 Its softly curved front edge prevents marking the fondant surface while the squared back of the smoother creates a straight edge along the base of the cake. Redesigned for an easier-to-hold contoured handle, the fondant smoother is designed to make the fondant-smoothing process more comfortable. It's so easy to have a perfect-looking fondant-covered cake — once you've covered your cake with fondant, smooth the sides of the cake and adhere the fondant to the buttercream under layer using this fondant tool. Smoother measures 3.25 in. x 5.75 in. (8,2 cm x 14,6 cm).